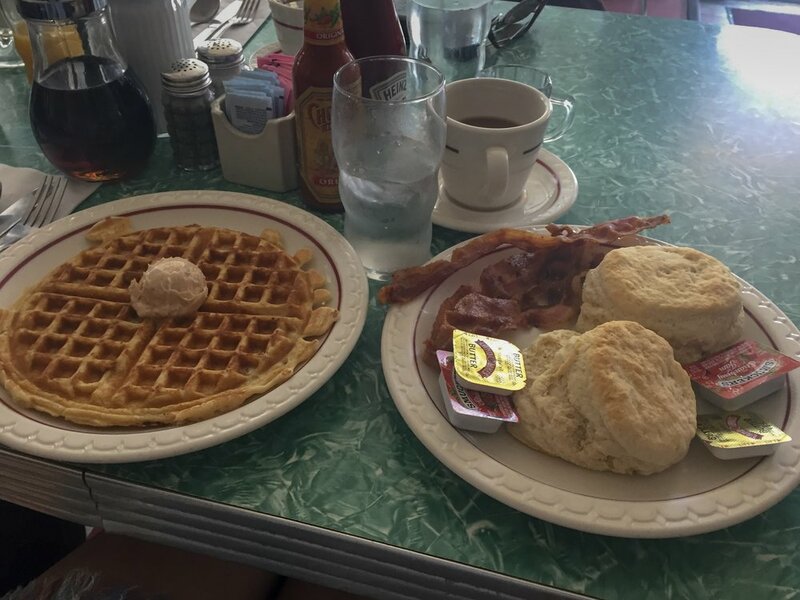 A good biscuit is a religious experience in the South. It must be pillowy, buttery, flaky, and yet sturdy enough to act - as one Cracker Barrel billboard reads - as a “spoon you can eat.” It requires a kind of alchemy to turn flour, water, and butter into the perfect biscuit. I went in search of just such a biscuit under the pretense of showing a friend from North Carolina a piece of Atlanta. We visited five fine-breakfasting establishments in the Midtown area in hopes of finding doughy nirvana, and had a lot of fun along the way. Spoiler alert: everywhere we went was delicious, so I have put together a perfect Saturday for anyone visiting Atlanta or any locals in need of a biscuit fix. We walked to the first three spots and drove to the last two, but the route is easily bikeable, if you’re into that. We began the morning at Callie’s Hot Little Biscuits in the Virginia Highlands neighborhood. Originally a Charleston operation, Callie’s opened its Atlanta location in 2016 and has quickly become a neighborhood staple. The small counter service shop puts out similarly tiny biscuits, which makes it easy to try several of the delicious flavor offerings. We chose blackberry, cheddar & chive, and a classic buttermilk, which I think was my favorite. Callie’s turned out to be the perfect amuse-bouche for the rest of our tour. Next on the route is Java Jive, just down the road from Ponce City Market. The exterior is unassuming, but prepare to time-travel to the 1950s when you step through the door. In keeping with the retro vibe, Java Jive’s biscuit is a textbook classic - palm-sized, light, and floury. She took the cake for my NC friend. I like my biscuits slightly more brown on top, but the Jive’s yogurt parfait would be reason enough to make a return trip. Our third stop was Madre & Mason, one of my favorite places for brunch in the city (partly because it is right across the street from my apartment - handy for the occasional hangover brunch). We split a Which Came First biscuit sandwich - fried chicken and a fried egg - which was delicious, even if the biscuit was a little overdone. A word of caution if you plan on replicating this tour: we did receive a bit of a nasty look from the chef for only ordering one item between us. Y’all. If you like a down-home, no frills diner, Home Grown GA is the place for you. We ended up getting our biscuits to-go because it was later in the day and there was a bit of a wait, but dear lord the biscuits were perfect. Still warm, big, flaky, slightly crispy on the outside. I can’t do it justice. I’m getting all nostalgic and drooly just thinking about it. Get yourself one. P.S. - If you visit Home Grown as a one-off and not part of this endless procession of biscuit, go all-in and order the comfy chicken biscuit - laid open, topped with fried chicken and smothered with sausage gravy. Praise. Our last stop on the biscuit train was an adorable, french-style cafe in Cabbagetown called Petit Chou. Their biscuits and gravy came topped with a poached egg and it was ooey gooey goodness. The biscuits themselves were nothing special after Home Grown, but I’ll definitely be returning to Petit Chou to try some of their other specialties. They do a mean spiked lavender lemonade, in case you need a digestif after all those biscuits!